MORE POWER. MORE CHOICE. MORE PROTECTION. Get the award-winning Faronics Anti-Virus security solution and rest assured that your IT assets are in safe hands. It not only provides exceptional virus, spyware and rootkit detection, but also includes firewall protection for comprehensive, rock-solid security. Best malware detection rate with the most advanced technology to combat millions of threats and detect the most complicated malware without slowing down your devices. Top-performing anti-malware engine to closely monitor your active apps and take instant action to ensure no malware goes un-detected, without any false alarms. 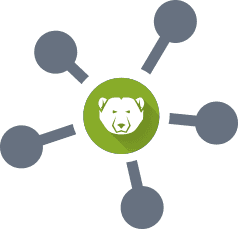 Provides multiple tiers of proactive protection with the built-in firewall that provides protection against potentially devastating attacks that originate from the network or internet. Incredibly powerful and ultra-fast at the same time. Ensures the most efficient use of memory, disk and CPU usage with complete protection. Out-of-the-box compatibility with Faronics Deep Freeze ensures virus definition files are always updated even when the computer is in a Frozen state. Manage endpoints across multiple locations from a cloud-based management console and protect your assets using the best-in-class antivirus solution. Security solutions from Faronics enables your business to innovate, improve defenses and improve risk. Only allow approved programs to go through and stops threats like targeted attacks, zero-day threats and mutated viruses. Anti-ransomware measures include the ability to stop processes from trying to rename file extensions that are known to be set by ransomware. 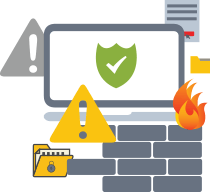 If malware somehow breaches the prevention barrier, premier antivirus with advanced firewall protection can stop all known viruses, worms, and trojans. The powerful reset mechanism of Deep Freeze ensures that simply rebooting systems will destroy any malware and instantly restore systems to a known safe state. 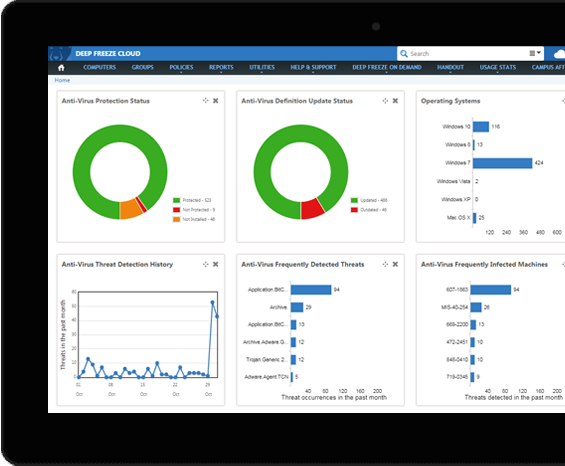 Configure multiple policies to protect your endpoints across multiple locations from a cloud-based management console. Instantly generate reports on protection status, scan history, quarantined files, firewall network traffic and much more. Restrict specific programs and protocols from accessing certain networks, computers, and IP addresses using the built-in firewall. Receive real-time alerts when a virus is detected or when definitions are not updated. Receive alerts via email or on the Deep Freeze Administrator Mobile App. Manage and track your computers with antivirus threat detection history, frequently detected threats and most infected machines using dynamic widgets. 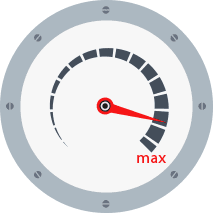 Top-performing anti-malware engine that closely monitors your active apps and yet offers the most efficient use of memory, disk and CPU usage. Faronics Anti-Virus has been awarded the illustrious VB100 certification by Virus Bulletin. For over 20 years, Virus Bulletin has been an independent testing body that evaluates and benchmarks security software. The VB100 award is earned by products that block all files from recently reported malware “in the wild”, while generating no false positives when scanning Virus Bulletin’s large and regularly updated collection of clean files. Get out-of-the-box compatibility with Faronics Deep Freeze to ensure virus definition files are always updated without having to “Thaw” the machine or put it in maintenance mode.